Her designer dress collections have been extremely well-received by the fashion set. And now Victoria Beckham has turned her talents to a range of charity T-shirts - and she's even managed to rope in her family to help her out. Victoria, David, Brooklyn, Romeo and even little Cruz have created a series of tops for Sport Relief with the aim of inspiring the nation to rise to the charitable challenge. Hundreds of thousands of people across the UK are expected to run the Sport Relief Mile on the weekend of March 20-21, with all money raised going towards the needy in the UK and the rest of the world. A host of famous faces from the world of sport and entertainment will be taking part in Sport Relief, including The One Show's Christine Bleakley, who will be water-skiing across the English Channel, and Blue Peter’s Helen Skelton, who will attempt to become the first woman to sail the Amazon river in a kayak. And rugby international Lawrence Dallaglio will cycle from Rome to all the Six Nations stadiums in a bid to raise thousands of pounds for the charity. On Friday, 19 March, the BBC will air a night of entertainment, with highlights including a sketch by comedy actor James Corden as his Gavin and Stacey character, Smithy, as well as special editions of Masterchef and Top Gear. Frank Skinner will be hosting a special edition of A Question of Sport Relief and there will also be a unique Strictly Come Dancing challenge for two twinkle-toed celebrities. Since its launch in 2002, more than 1.25 million people have taken part in Sport Relief, helping to raise over £75 million. In 2006, actor David Walliams’ swam across the English Channel in aid of the charity, while, last year, comedian Eddie Izzard raised £200,000 by running a marathon a day around the UK. 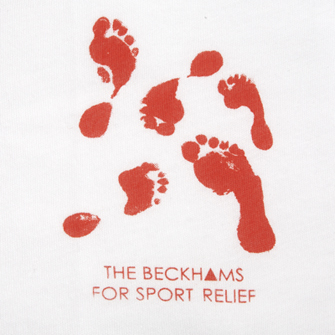 You can buy the Beckhams' T-shirts and sign up to run the Sport Relief Mile at www.sportrelief.com. The T-shirts are also being sold at Sainsbury's and TK Maxx.